We offer generator and transducer components for systems integrators and OEMs to make Ultrasonic Sieving and Screening systems. Due to the flexibility of our Multi-Frequency systems our clients now have the freedom to construct and supply their own complete screen resonators and ring frames. 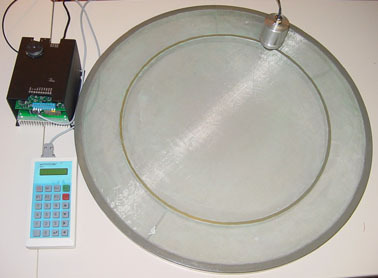 When matched with our Fixed-Frequency generators the ring resonators must be tuned to operate at the system resonant frequency. Wideband (sonic to megahertz) acoustic energy provides greater sieve/screen stimulation to improve process volumes (kg/hr) beyond the limitations of standard fixed frequency systems. 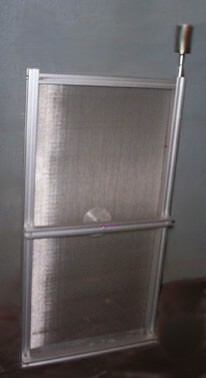 Eliminates damage to screens in high amplitude nodal points. By eliminating hot spots on the screen we can increase power to the entire screen and improve the rate of material processing. Programmable features allows greater processing flexibility with all kinds of powders and especially sticky and difficult powders. MMM technology will drive most any shape (round, oval, square, rectangle) sieve or screen, even large mass systems. MMM converters may be connected to most any efficient point on the sieve/screen or frame. A field adjustable resonant frequency option allows frames, rings, and resonators to be built without specific tuning. This means resonators designs can be simplified and produced at lower cost. The MMM system can adapt to most any other manufacturers installed sieving transducer and screen allowing a simple field upgrade. MMM Frequency Agility: The same DSP technology that allows the MMM generator to be adaptable to any shape sieve or screen is used to provide unprecedented frequency agility. Other fixed-frequency systems are driving the total acoustic system (converter & screen frame) at a frequency optimized for the converter without full consideration of how the screen frame is changing the whole system resonant frequency. Rather than fighting physics our systems are adapting to the new resonant frequency when an un-tuned mass (the screen frame) is attached to a converter. Normal MMM factory options allow for system resonant frequency adjustment within a 12 kHz window (e.g. 25 kHz to 37 kHz). Such agility allows fine tuning for optimum performance. MMM Converter Agility: Additional system flexibility is provided through adaptive inductive compensation that allows attachment and efficient driving of converters from other manufacturers. This allows us to improve existing ultrasonic systems through a simple MMM retrofit.